Why choose Jaw crusher as primary stone crusher in crushing plant ? NewsHome > News > Why choose Jaw crusher as primary stone crusher in crushing plant ? Jaw Crushers are historical and experienced stone crushing equipment in mining and construction industries. Jaw crusher advantages are wide feeding size, simple structure and excellent performance. Great Wall Company has been engaging in manufacturing mining machinery over 30 years, our jaw crushers are mainly consisted of PE jaw crusher and JC jaw crusher. Generally speaking, Jaw crusher is best choice for primary stone crusher in crushing plant. Our stone crushers experts give your some useful suggestions on jaw crusher. 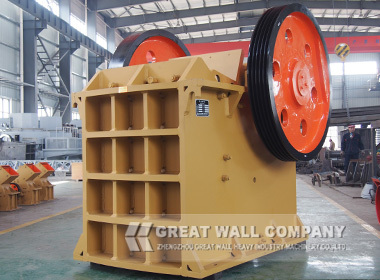 Firstly, There are big input size and hard raw materials in primary crushing process, Great Wall jaw crusher can process rocks up to 1020 mm, and the compressive strength is less than 320 mpa.On the secondary, Jaw crusher jaw plate and side guard plate are all durable service life, which not only reduce production cost, but also ensure the smooth operation in stone crushing production line.Welcome to visit us and free inquire jaw crusher price. Previous: How to buy suitable Iron ore jaw crusher in crushing plant? Next: What are mobile jaw crushing plant functions for construction waste?